From October 1 to November 4, get in the spirit as this supernatural celebration comes to life throughout Shanghai Disney Resort. Be part of the wicked fun—wearing your scariest, silliest, Disney-est costume. Trick or Treat – Get Your Sweets! Guests of all ages can stop by our special treat locations, say the magic words and devour devilishly delicious delights. Visit 6 spook-tacular stops on this “trail of treats” scavenger hunt. Each stop is decorated in a different haunting Halloween style and features favorite Disney Characters in costume, making for the perfect photo opportunity. Pose for pictures, then say the magic words, “Trick or Treat!” to collect your candy. Dress up, grab a treat bag and join this frightful feeding frenzy! Kids ages 16 and under will form a fun procession that roams door-to-door along the Disneytown lakeshore - collecting candy from the terrified, trembling townsfolk at the World of Disney Store, Mickey’s Playground, Walt Disney Grand Theatre and other locations. See Mickey and Minnie lead a parade where scary villains stir up mischief and costumed Guests are invited to come along! Meet a galleon of ghoulish privateers as they come ashore to plunder, pillage and cross swords with Captain Jack! Bring your little ghosts and goblins to Disneytown to experience all the haunting décor, wickedly wild fun and spooky special events! 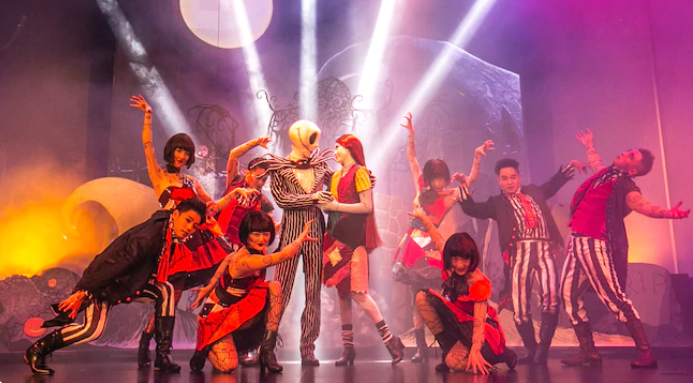 Shake your boo-ty with Jack Skellington and Sally as a live DJ leads a dance party to die for! Sink your teeth into special recipes conjured up by our head(less) chef.